This is almost exactly what happened with Harry Potter and the Order of the Phoenix (2007). The studio invested just over $300 million to make the film and it grossed almost $1 billion from the box office and other distribution deals. But, instead of making $700 million, it actually lost $167 million (on paper). So, what happened to all of that money? Hollywood has their own system of accounting, often referred to as “Hollywood Accounting” or “Hollywood Bookkeeping” where only about 5% of films actually show a profit. How? Because the film itself is a corporation, that company is loaned money by the studio to make the film. The film pays the studio interest on that loan, which is one way to channel money back to studio. Also, the studio generally owns other verticals where the film corporation can pay for things like advertising. For example, Harry Potter was made by Warner Bros, a subsidiary of Time Warner. Time Warner owns multiple TV networks and publications where the film company could buy advertising, thus channeling more money back to the parent company. There are also distribution costs. The parent company may also have business interests in these channels where they can pay themselves again. All of these things are done to essentially bankrupt the corporation that was formed to make that single film. Why? If there are no profits, they don’t have to pay partners who agreed to a share of net profits. This is why you’ll often see some heavy hitters get a share of the box office or gross income instead of net profit. Depending on how they setup the initial investment in the film entity, there may also be a payroll tax advantage to financing the film this way. 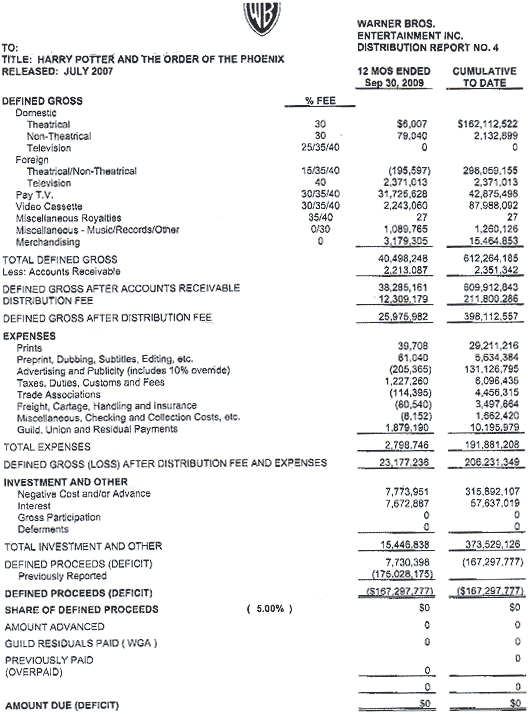 There have been plenty of lawsuits over this type of accounting and the film company often loses. Jurors have awarded favorable settlements to actors and other partners who have been shorted money due to hollywood accounting. Although one judge called it, “unconscionable” — it’s not illegal. Entry filed under: Entertainment, Law, Money. Tags: accounting, bookkeeping, film, hollywood, piracy, tax, taxes. It’s sounds like somebody else ate JK Rowlings’ pie…ouch! Greedy always wanting that money. No wonder a movie ticket is so high. Surely there must be more reasons (tax or something) because the industry/suppliers would get wise to this trick so they’d only be able to pull it once or twice before no one would deal with them.